In certain circles of the horror fan community, Spanish writer/director/actor Paul Naschy is considered to be one of the genre's all-time greatest icons, and of the 100+ acting credits had to his name Naschy is best known for playing a Polish man named Waldemar Daninsky in a series of loosely connected films. Naschy played Waldemar a total of twelve times, although one of them has never been seen because it was never completed - the director was killed in a car accident during production. 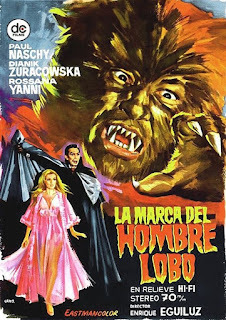 The first Waldemar Daninsky film is La Marca del Hombre Lobo (The Mark of the Wolfman), which was released in the United States as Frankenstein's Bloody Terror because distributor Samuel M. Sherman had already promised exhibitors that he would deliver a film with that title. 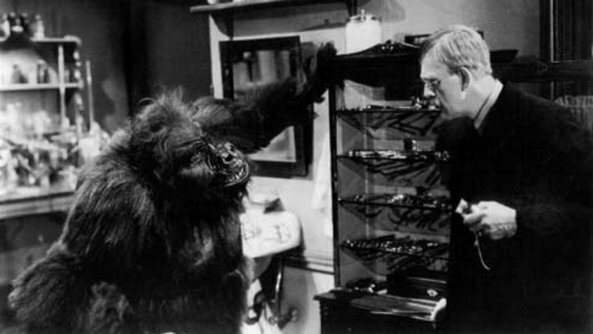 When he couldn't find a suitable Frankenstein movie on the market, he bought this werewolf movie and just slapped the Frankenstein title on it, along with an opening narration that claims this is "The most frightening Frankenstein story of all, as the ancient werewolf curse brands the family of monster makers as Wolfstein. Wolfstein! The inhuman clan of blood-hungry wolf monsters!" There is indeed a character named Wolfstein in the story, Imre Wolfstein, a man who was bitten by a werewolf while on vacation in Tibet. Now a werewolf himself, Imre returned to his home in Germany, where he spread terror throughout the German countryside until someone figured out that he was the wolfman causing so much trouble. A silver dagger was driven through Imre's heart and he was locked away in the family vault on the Wolfstein property. For decades, the Wolfstein castle has stood abandoned. Most people don't like to go there, although there is an odd fellow named Waldemar who likes to hang out in the ruins. Problem is, a werewolf can only truly be killed with a silver bullet fired by someone who loves them. Imre is only lying in a dormant state because that dagger is in his heart. If it's removed, he will be revived. And of course that happens, when a couple decide to raid his tomb while squatting in the castle for a night. As the resurrected Imre returns to his hobby of mauling and mutilating people, his murders are blamed on wild wolves that must have come down from the mountains. Waldemar is almost undeniably certain Imre is actually responsible, but he keeps this information to himself while joining in on the wolf hunt. It's while on a hunt he receives the curse that will carry him through several more films, as he is attacked by Imre and bitten. Imre gets that dagger in his heart again, since Waldemar had retrieved it from the castle, but Waldemar is now a werewolf himself. In stabbing Imre, Waldemar saved the life of a young man named Rudolph, who tries to help him figure out how to deal with the werewolf curse despite the fact that Waldemar has recently lured his girlfriend Janice away from him. But this isn't just another simple story about a man struggling with the curse of lycanthrophy. The search for a cure leads Waldemar to Dr. Janos Mikhelov and his wife Wandessa. Janos claims to be the son of the doctor who was trying to help Imre with his condition back in the 1920s, but he is actually the same man. He hasn't aged since the '20s because the Mikhelovs are Satan-worshipping vampires who don't intend to help Waldemar at all. They want to make the situation even worse. 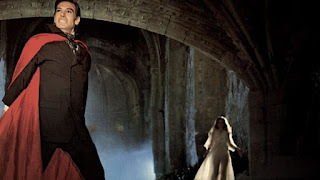 The addition of vampires into the mix is a great twist that takes the film into a completely different direction in the second half, and I appreciated that Janos did vampirism right, going full Dracula stereotype and donning a cape. This all builds up to a great monster mash of a climax that was far more interesting than what I was expecting when I started watching this movie. Although I've heard a lot of hype for Naschy over the years, I was a bit resistant, I had trouble getting into what I saw of the Waldemar Daninsky series. My first exposure to it was a screening of one of the sequels, The Werewolf Versus the Vampire Woman, during a theatrical horror marathon several years ago. It probably didn't help that I was sleepy by the time the movie began, but I found it to be extremely dull. That was a feeling that carried over whenever I would try to watch The Mark of the Wolfman, too. I couldn't get into it, there was just something off-putting about it to me, it felt too sluggish. Finally, inspired by the passion displayed for Naschy by Cort Psyops on the Cinema Psyops podcast and Rod Barnett and Troy Guinn of the NaschyCast (yes, a podcast dedicated entirely to the career of Paul Naschy), I gave The Mark of the Wolfman one more honest try... and this time it clicked. I really enjoyed this viewing of the movie. I actually got through it. I found out that there are vampires in it as well as werewolves. (But no Frankenstein.) Waldemar fought a vampire woman even before The Werewolf Versus the Vampire Woman. Whodathunk? This is actually a really cool monster movie. The tone and pace took some getting used to, but once I did I was glad I was watching The Mark of the Wolfman. In the end, I was left wanting to see more Waldemar Daninsky movies, and thankfully there are a bunch of them for me to seek out. Rogue One, a Star Wars story that occurs outside of the "trilogies saga", has done quite well, having received an 85% positive reaction from critics and made over a billion dollars at the global box office. Still, that's a billion less than what Star Wars Episode VII - The Force Awakens made during a similar period of time, and I have seen a split in its reception among fans: while many have said that it's their second favorite Star Wars film behind Episode V - The Empire Strikes Back, I've also seen several fans say that they were underwhelmed by it because it didn't feel Star Wars enough. I would fall somewhere in the middle. Rogue One does feel very different than any other entry in the Star Wars franchise; director Garth Edwards was going for more of a grounded war movie feel, and achieved that. This didn't feel as fun as many Star Wars films do, and I didn't connect with it emotionally the way I do with the Skywalker saga. That said, the film did still manage to tug on my heartstrings once characters we've been following started falling in the climactic battle. Having been very disappointed with Edwards' take on Godzilla in 2014, I was somewhat wary of Rogue One going in, afraid that his Star Wars movie would be just as dull and unsatisfying as I felt his Godzilla movie was. Thankfully, that wasn't the case. While I wasn't always engaged by what was going on and there were times when I was wondering why they had even bothered to tell this story (the story of how the Rebels acquired the blueprint of the Death Star, and why the Death Star had such a glaring weakness, leading into the events of Episode IV - A New Hope) I was left with a positive outlook on the film. Not as positive as I was about The Force Awakens, but a positive one. The box office take seems appropriate to me. 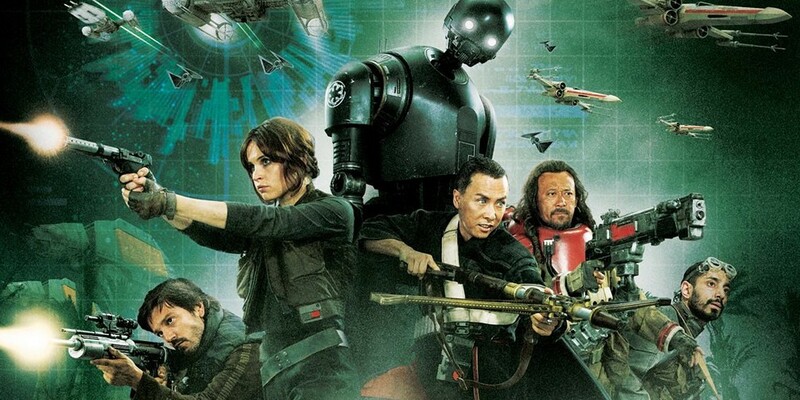 Give Rogue One a billion, give The Force Awakens two. Based out of the Washington D.C. area, Count Gore De Vol has been hosting horror since 1971, and is credited as being "the first horror host on the internet", as he has been presenting episodes of his show at CountGore.com ever since 1998. Count Gore first came to my attention through his guest appearances at the Cinema Wasteland convention, and I've been checking his show out online frequently for several years now. 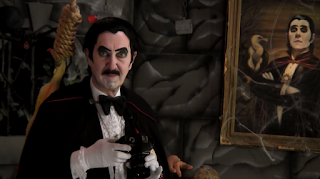 In an episode uploaded in December of 2016, Count Gore, a vampire who shows movies from his crypt, hosts a showing of the 1940 Boris Karloff movie The Ape, which the Count describes as one of Karloff's lesser films. That assessment would seem to be accurate, as the movie - which was directed by William Nigh from a screenplay by Curt Siodmak and Richard Carroll - isn't all that good. However, it remains watchable thanks to the presence of Karloff, the perfectly short one hour running time, and the bonkers story, which was based on a stage play by Adam Hull Shirk. As Count tries to explain during the opening segment, the film centers on a doctor (Karloff) who is looked down upon by the people of a small town despite his valiant effort to cure a young woman (who reminds him of the daughter he lost) who has been stricken with polio. The townspeople feel that the doctor has questionable methods, and he will go on to prove them right. The spinal fluid of other people is required for his polio cure, and he takes an unscrupulous approach to gathering it. But it's not as simple as Karloff just going out and killing people for their spinal fluid. 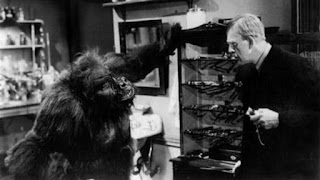 When an ape escapes from a circus, it winds up rampaging through the doctor's laboratory. After he kills the bloodthirsty beast, he decides that the way to harvest spinal fluid is to skin the ape, then disguise himself as the animal by wearing its skin as he prowls the neighborhood at night. You can be certain that Jonas Salk didn't do anything like this when coming up with the polio vaccine fifteen years later. It's a ridiculous story, but of all the man-in-suit ape movies out there, I'd say this has one of the cooler ape costumes. I like how bulky it is. Occasionally the episode will cut back to Count Gore in his laboratory, where he is trying to put together a marketing campaign for his hoodies and night shirts. He has brought in a model who he drools over while trying to pass himself off as being a professional photographer, but it's very obvious that photography is not his forte and we get some awkward humor from his interactions with the model. This was a fun episode, built around a movie with such an absurd concept that it's a must see. Just be prepared for its lackluster execution. There was a major creative shake-up behind the scenes of The Walking Dead over the course of season two, as filmmaker Frank Darabont, who had developed the series for AMC (based on the comic book by Robert Kirkman), ended up being replaced as showrunner by Glen Mazzara, who had written one of season one's episodes and was brought back to work on season two. Some viewers say they can see the change in the show during season two, but given that Darabont played a major part in assembling it I find it hard to pinpoint. However, there is a character death I don't think would have occurred if Darabont had continued on. Season two is a divisive one even beyond the loss of Darabont. At thirteen episodes, it more than doubles season one's six count, and it certainly didn't use that extra time to pack in even more action and adventure. Although there are trips to the zombie-ridden nearby town, the season is primarily set at a farmhouse that sits on a patch of tranquil countryside largely untouched by the living dead. It's more of a slow burn, and lots of people found this season to be too slow. 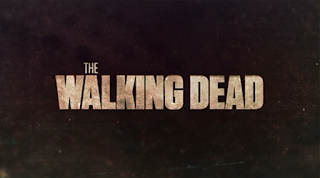 The season picks up directly after the explosive finale of season one, with our main group of survivors - Andrew Lincoln as former police officer and natural leader Rick Grimes, Sarah Wayne Callies as his wife Lori, Chandler Riggs as their son Carl, Jon Berthal as Rick's former partner Shane (who had a fling with Lori when they thought Rick was dead), Norman Reedus as tough but caring redneck Daryl, Steven Yuen as former pizza delivery boy Glenn, Jeffrey DeMunn as conscientious widower Dale, Melissa McBride as widowed housewife Carol, Madison Lintz as Carol's daughter Sophia, IronE Singleton as conflicted team player "T-Dog", and Laurie Holden as Andrea, who is still mourning the loss of her sister in the previous season - out on the road. One of their vehicles has a mechanical issue at the same time they reach a massive roadblock of abandoned cars on the highway, and if that weren't bad enough, a herd of zombies also comes swarming through the scene. To escape the zombies, Sophia runs off into the woods beside the highway... and disappears. The characters proceed to search for Sophia for the first half of the season, then deal with the repercussions of finding her in the second half. Some viewers felt that there was too much time spent on the search, and we do get a whole lot of scenes in which characters wander through locations, looking for this little girl. We also see Rick planning the day's search pattern on multiple occasions. 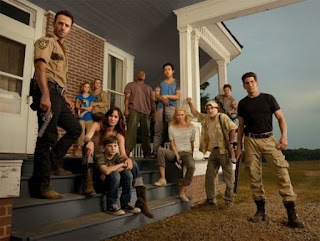 Even so, I feel that there is still something interesting going on in most of these scenes, whether that interesting element be a zombie attack, Daryl getting injured and hallucinating a guest appearance by his hardcase brother Merle (Michael Rooker), or character interaction that chips away at the structure of the crumbling group. The setting is peaceful, but this season has the group dynamic at its most tumultuous. The Walking Dead is admittedly a soap opera with zombies, and there is a lot of drama in season two. Drama like Andrea going through a change fueled by grief over the loss of her sister and bitterness with Dale for not letting her die in that season one finale explosion. Like Lori discovering she's pregnant and having to reveal to Rick what was going on between her and Shane. Arguments over how to handle moral issues in this apocalyptic world. Do they become cold-blooded barbarians, or do they hold on to their humanity? More than anything else, drama comes from the gradual psychological breakdown Shane has as he watches Rick take over as Lori and Carl's protector after he has dedicated his life to them. Shane is a ticking time bomb, dangerous to everyone around him. The fall of Shane is what defines season two for me. This is what sticks with me. As the Georgia summer sun beats down on the characters, there is a thick atmosphere of dread and tension over the interactions with Shane. He's going to snap, he's going to get people killed, he's going to kill people without a second thought. In the midst of this, we also meet some new characters; the Greene family, who live on the farm where the group seeks refuge. 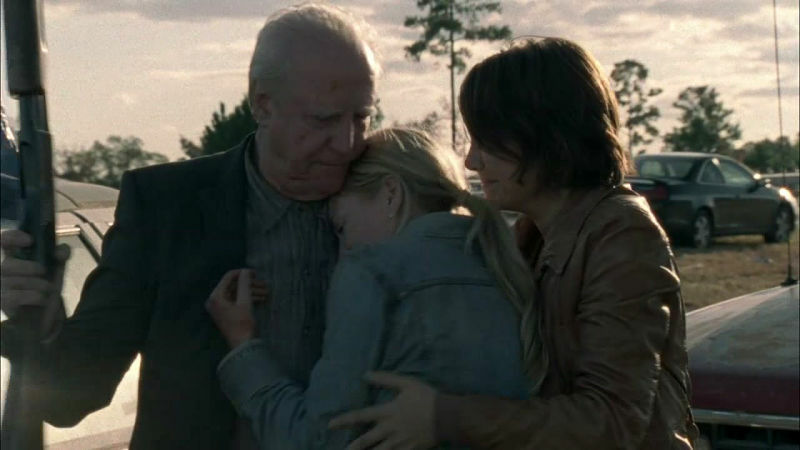 There's family patriarch Hershel (Scott Wilson), whose medical experience comes in handy even though he was a veterinarian, his daughters Maggie (Lauren Cohan) and Beth (Emily Kinney), Beth's boyfriend Jimmy (James Allen McCune), farmhand Otis (Pruitt Taylor Vince), and Otis's wife Patricia (Jane McNeill). They don't all make it through the season, at least one of them dies very early, but some of them are major additions to the show. Hershel has a very different view of the walking dead than Rick's group does, but the two men come to an understanding and have a mutual respect... Which is put in jeopardy by Shane's antics. The fiery Maggie strikes up a relationship with Glenn, a relationship that would quickly become one of my favorite things about the show overall. People put it down, but season two contains some of the most memorable moments of the series for me, most of which center on the dramatic aspect. I was deeply emotionally invested in this season, and I began to hate Shane and the moody Andrea with a passion as things played out. I couldn't wait for Shane to exit the show. I sided with Dale in the moral debates over keeping their humanity. I was captivated by a particular scene late in the season in which Rick and Hershel encounter two strangers in a bar. This scene seems to have gotten overshadowed by other, more violent encounters with fellow survivors over the seasons that have followed, but this remains one of the most effective to me. Of course, the thing that drew me to The Walking Dead in the first place were the zombies, and there is some great zombie related material in this season as well. Hershel's view of the dead is reminiscent of the people in the apartment building at the beginning of George A. Romero's Dawn of the Dead, he gathers the dead in a way reminiscent of Day of the Dead, and there is a fantastic, Romero-style scene in the first episode. Romero's zombies would instinctively return to places that were important to them in their lives, like the shopping mall in Dawn. When The Walking Dead group enters a small church, they find zombies inside, sitting in the pews. Moments like that really bring a smile to this Romero fan's face. The season builds up to a Night of the Living Dead-esque scenario, with a herd zombies shambling across the countryside toward the boarded-up farmhouse, but the main character tensions have been relieved by that point, so we don't get a replay of NOTLD with people who can't stand each other getting trapped in the house together. Instead, this set-up just allows for 16 minutes of action. In that final episode, it becomes very obvious that my Romero obsession clouds my view of the series, because toward the end Rick makes the shocking revelation that you don't have to be bit by a zombie to become a zombie. No matter how you die, you will become one. Since that's established in the Romero films, I had assumed that was the case from the beginning of the first episode. The way Rick explains this is that everyone is "infected" with whatever is causing the zombie plague. That's a lame way to describe it. It was said better in Dawn of the Dead: "Every dead body that is not exterminated becomes one of them. It gets up and kills! The people it kills get up and kill!" I'm baffled as to how these characters could have gotten this far into a zombie apocalypse without realizing it's the dead that are walking, not just the bitten dead. This was figured out almost immediately in Night of the Living Dead, the characters in that movie had this shocking information within hours. These characters are kind of slow to pick up on things sometimes. Anyway. The Walking Dead season two is slower than its predecessor, but for me the tension and the pay-offs make it worth the time spent watching the build-up.